You’ll get fastest answers to most questions at this website, or at a meeting. 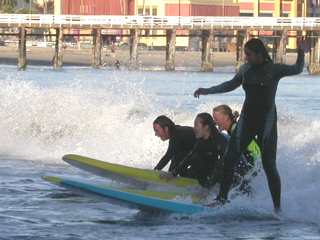 We offer the widest range of activities of any club at De Anza. 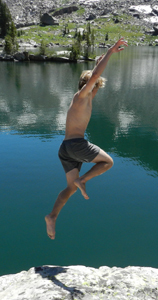 We camp, hike, backpack, kayak, cycle, go horseback riding, caving and surfing. The club gives lessons or gets a good price for lessons from professional instructors. Almost all of our camping trips have people who have never been camping before; even the winter trips camping with snow on the ground. You don’t have to be a club member to go on events, just a De Anza student (or most faculty/staff). The main rules common to most of our trips are at: Outdoor Club trip rules. We usually have around 30 to 40 members and some students do things with us without becoming members. Our members range from grizzled backpackers to people who bring half their life’s possessions with them when they camp. 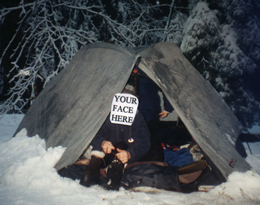 The Outdoor Club is a completely volunteer organization, neither the officers nor the advisor are paid. As a result you will not get the same ‘service’ from us as from a professional group. We do not have the time to return phone calls or emails from people asking questions that they could have found the answers to by simply looking through this website. We can’t always find a way to sign up people who can’t make it to our regular meetings, to a class when we are there, or to a table we have on campus. If none of the times we have available for signups are convenient for you, we don’t have enough people to be able to meet personally with you and sign you up. People who wait until the last minute to sign up are sometimes left out. Please don’t e-mail the club advisor (this website) as I don’t have the time to answer club info requests, just look around the pages. You can’t just show up for an off-campus event and expect to participate without having signed up (trip agreement/releases) in advance in person. You can’t sign up on-line, by email or at this website, each student must appear in person to sign up. Your friend or even your spouse can’t sign the required trip agreement. If you are under 18 a parent/guardian will also need appear in person to sign the paperwork. It can take a lot of time to fill out all the needed paperwork. Signing up for off campus events will go faster if you have done one of the releases in advance, go to: field trip release to print one in advance. You can’t sign up without paying for an event. If you pay for the event and don’t do trip paperwork, and/or don’t attend, you will not get a refund. If you pay for the trip before doing paperwork and then do not get the paperwork done and in the hands of the faculty advisor before the trip, you will not get a refund and can not just show up and try to participate. Will you bring real rain gear (like a hooded rain jacket and rain pants) on our trips, or will the faculty advisor make a garbage bag ‘rain jacket’ for you? Only currently enrolled De Anza students can go on club events. People who want to go on an event between quarters must be enrolled in the following quarter. For example, to go on a late summer trip you need to be already enrolled in Fall quarter. Faculty are subject to various rules depending on whether they are full time, ten month, part time, on sabbatical or Article 19 and should contact the club advisor well in advance of an event they want to participate in. Interesting weather does not cancel club events. No refunds for no-shows. 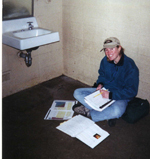 This girl was caught studying in the restroom at 5 a.m. on one of our Yosemite winter trips. Why in the restroom? Because it’s heated in the winter and you can save on flashlight batteries. At 5 a.m. it’s quiet except for the coyotes howling in the distance. Lots of people study on our trips, bringing homework, projects and even laptops. Some study in cars on the way to and from the trip. This might not be as effective as studying at home, but you’ve got to get away and have fun sometime! De Anza College home games also has links to student recitals, dance performances and art exhibitions.